How Do You Become a School Nurse? Are you looking for a guide on how to become a school nurse? If your goal is to work as a school nurse in public or private schools, it is important to learn the steps that you must take to turn your dream into a reality. 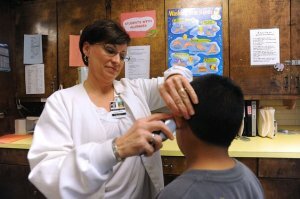 The qualification to become a school nurse are not the same across the board, but typically schools will only employ licensed practical nurses when the person employed has been with the district for several years or when they have years of experience that will replace requirements for a bachelor’s degree. You must take the time to review the requirements to work as a school nurse so that you prepare to provide health counseling and nurse care to students and staff. Read this basic guide to becoming a school nurse for the information that you need to know. What Are Education Requirements to Become a School Nurse? You must earn a nursing degree or equivalent to pursue a career as a school nurse. To become a certified professional, the National Association of School Nurses recommends that schools hire candidates who posses no less than a bachelor’s degree in Nursing. Individuals who have been working as LPN’s for several years may be required to move up and earn their Bachelor of Science in Nursing to meet state level requirements when the state follows the recommendations of the NASN. It is important to check with your state to learn if there are specific educational requirements or courses that you must have completed before you can apply for licensure. If there are, you will need to have this coursework complete before you apply to sit for any certification exams. You can find out the requirements in your state by contacting the NASN affiliate in the state. Once you earn your BSN or you complete an acceptable nursing program, you will need to test to become a registered nurse. Being an RN is crucial when you want to work in school nursing. When you test for your RN license and you pass the exam, you will need to move on and work in the field as an RN so that you can add this experience to your resume. You will need experience to become certified in the field as well. A majority of states require school nurses to become nationally certified before professionals can practice. Some states will also require candidates to possess a certain number of years of experience in acute care before anyone will be granted their certification. You must be a registered nurse and satisfy the educational requirements before you can test with the National Board for Certification for School Nurses. Even if this certification is not required, being certified in the field will give you a major advantage when you are searching for openings in your area. Once you are registered and you have taken field-specific coursework in child development, you may want to try and fill in substitute nursing roles while you are trying to get certified. This will help you get your foot in the door so that you can build your reputation and create a network of professionals that you can turn to. Use these tips to become a school nurse and refer to state requirements.